Last week, I found myself in north Scottsdale, looking for quick lunchtime options off the 101 freeway at the Raintree exit. As I neared my default destination for that area (good old reliable Kokopelli) I noticed a commotion in the parking lot of the nearby Whole Foods Market. Upon closer inspection, I discovered a half dozen or more food carts cordoned off behind yellow tape. I’ve enjoyed the food cart experience in other cities such as Portland and Austin, but I was surprised to find this kind of activity in my own backyard — especially in July. I learned that the Raintree Whole Foods has been hosting regular events by the Phoenix Street Food Coalition for some time. There among the hot dogs, ice cream, pastries and chicken burritos, I discovered the beet strEAT truck and their lentil tacos. The beat strEAT menu was full of vegan enticements — hummus, veggie burgers, raw salads, etc. — but there’s nothing we at “Four Legs Good” like better than lentils and tacos. This was a match made in heaven. I had to ask them to leave off a couple non-vegan toppings, but after that it was off the races. Since I was in somewhat of a rush, I made short work of the meal. I had little time to savor the generous twin delicacies I received, but they were both excellent. My only regret was the absence of your regular reporter. She would have loved these tacos. We are not the first blog to take notice of beet strEAT. The Phoenix New Times recently interviewed owner Clea Senneville for “Chow Bella.” But we are happy to join the clamor for more food carting in the valley. We look forward to more beet strEAT events in the future. This is just a reminder that if you haven’t been to the Pomegranate Café in Ahwatukee, Ariz. (south of central Phoenix) yet, you are seriously missing out. They keep their daily specials current on their Facebook page, which is great motivation to get us to go there despite living 30+ minutes away. Today I was drawn to the restaurant for their blueberry and lemon flapjacks special and out of curiosity to see if their frittata special was vegan (it wasn’t), but we ended up ordering two different specials. It’s the only place in town where it actually pains me to have to decide what to get each visit because I want to try everything. When they keep featuring such creative and tasty specials, it makes it even harder for a Libra like me to make a decision! After ruling out the frittata, I went with the summer vegetable quesadilla special. 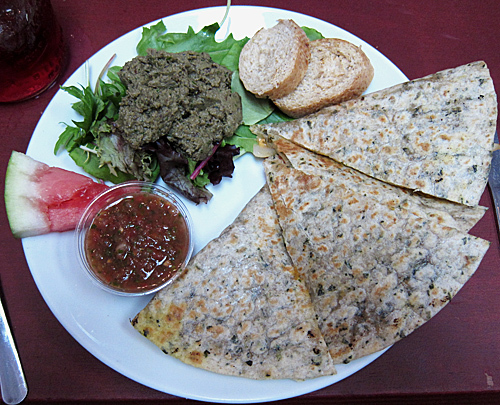 It was a lot better than the last quesadilla I had at Pomegranate, because it was full of sweet potatoes, zucchini, green chili peppers and oodles of my favorite vegan food item – Daiya cheese. It was served with a side of baba ganoush, which I didn’t think was necessary. I’d rather have chips or a green salad instead. My husband settled on the scramble special. 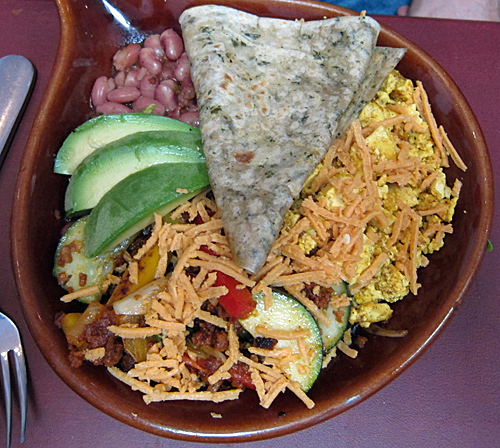 This consisted of vegan chorizo; tofu; sautéed peppers, onions and zucchini; avocado; pinto beans and Daiya vegan cheese, plus a spinach tortilla. The chorizo was full of flavor and spiced up the dish. 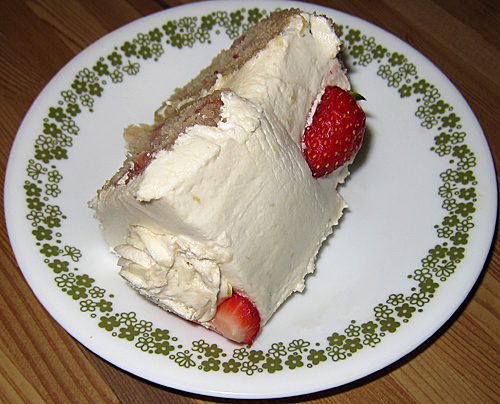 We also got a slice of strawberry cake to-go. That’s going to be dessert later tonight, but I took a nibble and it was outstandingly yummy. Pomegranate was absolutely packed today, which leads me to believe they need to expand soon! Here’s hoping they open a restaurant in central Phoenix someday! One of the rules of dining out for vegan and vegetarians in Phoenix is “when in doubt, go to Pita Jungle ” Pita Jungle is what I would call a home-grown chain in Phoenix. It started as a small restaurant in a strip mall in Tempe, and has blossomed into a multi-city, multi-state dining enterprise which, lucky for us, has a healthy helping of vegetarian and vegan options on the menu. They even have a “vegan chart” on the website! If you’re vegan, you can order anything with a “yes” next to it, or make small alterations to many dishes to make them vegan. 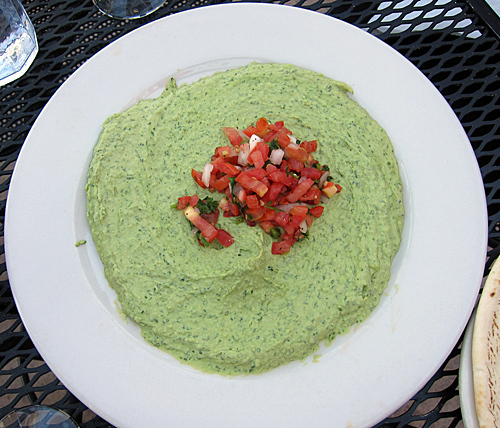 Our all-time favorite is the Cilantro Jalapeno Hummus. Get an extra pita because you’re going to want to scrape the dish. 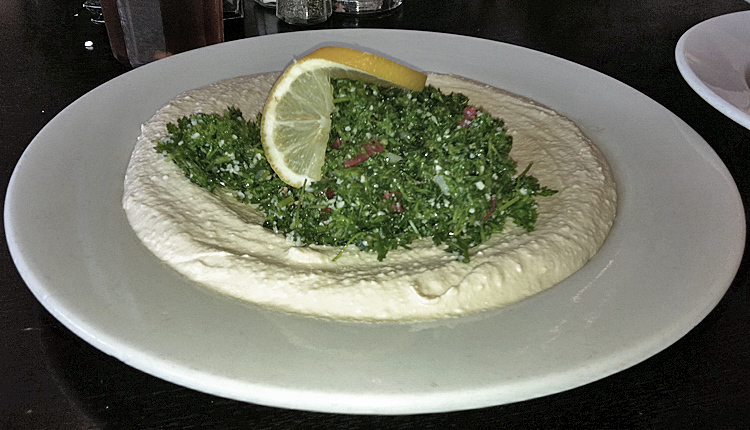 The Hummus & Taboule is also great, if you’re okay with mixing textures. 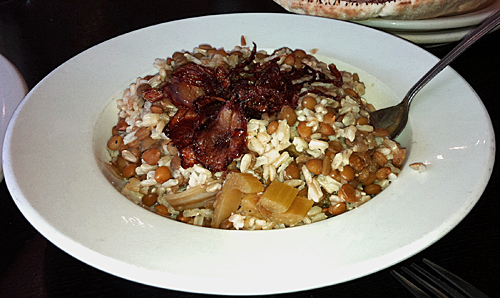 We also recently enjoyed a side of Lentils & Rice. It’s enough for a whole meal actually, and next time I may ask for double the amount of caramelized onions. Yum. While there are plenty of other vegan salad and main meal options to pick from, such as the falafels, pita burrito, or veggie garden wrap, I always default to the Macro Platter. 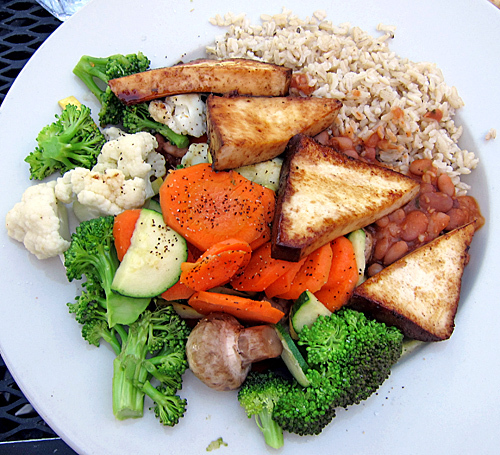 It’s a lightly seasoned combination of brown rice, fresh steamed veggies, grilled tofu and Pita Jungle’s delicious variety of beans. It’s fairly basic, but enough for two (with a side of hummus, of course) and very satisfying! Because the menu is so vegan-friendly compared to most, it’s easy to make assumptions on things that are usually vegan. Thanks to the vegan chart, I know to avoid the Greek pitas, veggie & black bean patties and buns. A Pita Jungle can be found just about anywhere you go in the greater Phoenix metro – even in the Scottsdale Fashion Square mall! The only downside to the restaurant chain is no matter which one you go to, it’s always loud. I used to bring family and clients to Pita Jungles because of the “something for everyone” quality of the menu, but it’s just too hard to have a conversation. If the weather is bearable and there is a patio spot available, I usually default to that option. To-go is always a nice alternative too – especially for the hummus. 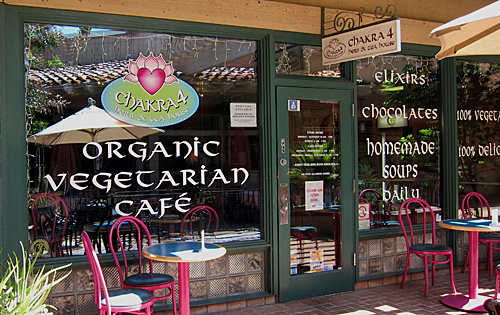 Several years ago, I eagerly anticipated the opening of the vegetarian café inside Chakra 4 – an herb shop two blocks from my office. My excitement was dampened after I tried it a couple of times and experienced extremely slow service, high prices ($15 for a wrap? ), and average-quality food. In short: I wrote it off. However, during the past few months I’ve been struggling to find places to dine at in Phoenix that aren’t “cheats” on my new “nutrient-focused, food-as-cure” vegan diet (i.e. tons of greens, less wheat and salt, no processed food). Let’s face it, I grew up in the high-salt, everything fried, processed food generation. I love Green the most in town and can’t live without Daiya now that I’ve found it. But given my new commitment to “eating for health,” I took another look at Chakra 4’s menu online and thought it might be worth revisiting. I’ve been there four times since. They clearly made improvements to the food since my previous experiences, and the slow service issues have been fixed too. On my first re-visit, I tried the Black Bean Sunflower wrap (made vegan). Sorry – I didn’t take pictures as I wasn’t expecting much. The veggies were all incredibly fresh, the black bean hummus was entirely unique and flavorful, and I loved the chipotle salsa. I immediately called my husband and told him we’d be going there together soon. During the next visit, husband in tow, I tried a seasonal special — the “Hercules” burrito. It was at its essence a bean burrito, but it was full of fresh veggies and excellent salsa. It’s been hard for me to not order it on every following trip, but I had to try more items! My husband ordered the Basil Pesto Foccacia (made vegan with raw nut cheese). 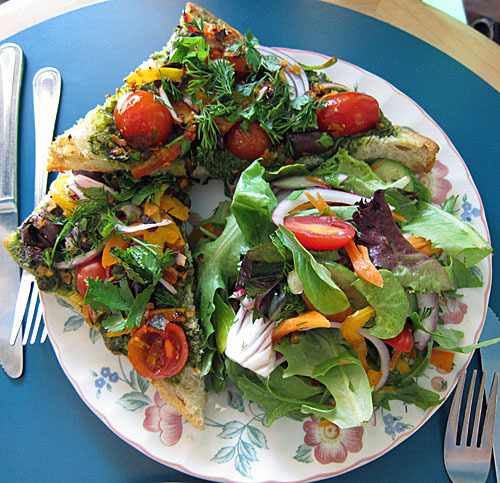 It was loaded with great veggies, and the pesto was some of the best I’ve ever tried. The bread (while not gluten-free) was also incredibly tempting. I had to try several bites (just to make sure it was as good as the first bite, of course). Within a week or two, we were back again. 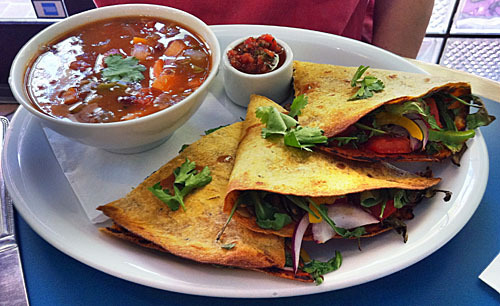 This trip, I tried the Veggie-Dilla with a side of soup. It was similar to the Hercules, but less dense, more crispy, and I really enjoyed the soup – which I think was a red bean soup but can’t remember for sure. I had yet another favorite. My husband got the Mediterranean Wrapsody (again made vegan with no feta). This was a lighter choice – full of fresh, crisp vegetables that are perfect for the summer heat. The kale wasn’t too tough (they got rid of the stems), the wrap was flavorful, and the cashew cheese added taste and texture but wasn’t overwhelming. He ordered it with the quinoa pilaf, which was a nice side but nothing out of this world. I took a business colleague with me for trip number four, and unfortunately forgot my camera for this visit. It was a hard decision for me to not order something I’d already tried, but this time I selected the Green Lentil Curry. Sadly, this menu item reminded me of why I didn’t like Chakra 4 when I first visited years ago. Instead of being a saucy rich curry over rice, it was a tiny dish of lightly flavored and fairly dry lentils, a separate small dish of rice, another one of bland steamed veggies, a side of darn good chutney and for some odd reason, a few big pieces of collard greens. I didn’t know what to do with it all so I made little collard wraps out of the items. The lentils were “okay” but it certainly wasn’t what I’d consider to be a curry. It left me feeling pretty disappointed, in that “I should have ordered the foccacia or veggie-dilla” way. My colleague ordered the half Nutty Rawvocado wrap and miso mushroom soup. He seemed particularly pleased with the soup, but fully enjoyed the wrap too! I’m not a fan of avocados or mushrooms, so I didn’t sample either. 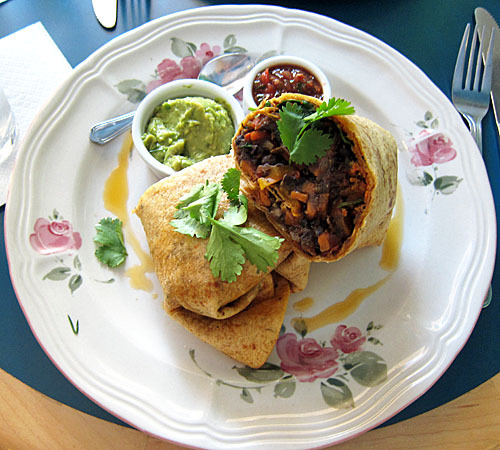 They understand how to make healthy vegan food taste good and have a very creative menu. The restaurant’s motto is “Organic Vegetarian Food to Nourish the Body and Soul” and they aren’t fibbing. They serve fresh, organic food and have tons of gluten-free and vegan options. 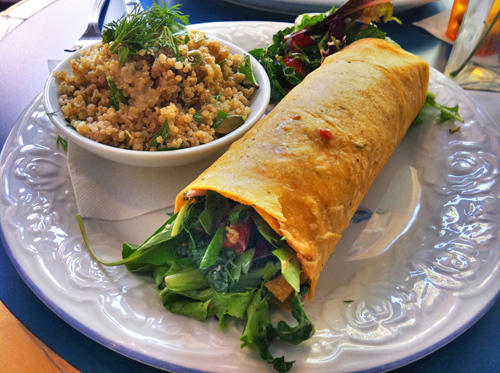 All the wraps can be made with a spinach tortilla, sun-dried tomato tortilla, whole grain bread, or kale leaf. It’s in a great location – tucked behind the Trader Joe’s at the Town and Country shopping center on 20th St. and Camelback Rd. They have a tremendous variety of hot teas (but need to offer more iced versions during the summer!). They’re open on Sundays! Seven days a week actually! The two-top seats are very small and they don’t let you move to a four-seater unless they’re completely dead. The prices are still pretty darn high. I haven’t found a vegan dessert worth writing about yet… but I’m still trying. No doubt I’ll be back again soon to keep working my way through the menu. Next on my “to try” list is the Apollo Pomodoro wrap, or maybe the Golden Hummus wrap. I can’t believe I could have been eating here for years, so I’m going to make up for lost time!